Venezuela was once the democratic exception. In a continent dominated by military dictatorships, the two-party system installed after the fall of Gen. Marcos Pérez Jiménez in 1958 stood out as peaceful, prosperous and apparently pluralistic. Based on the distribution of oil rents, it began to founder as per capita income slumped in the 1980s, amid a welter of corruption, back-stabbing and political short-sightedness. Into the vacuum strode a military strongman with a messianic streak and a disdain for representative democracy. Having tried, and failed, to take power by force in 1992, Hugo Chávez was elected president by a large margin in 1998 and survived (albeit barely) a coup attempt against him three years into his presidency. By a stroke of luck, the oil industry was about to experience its most sustained boom in history, enabling Chávez to purchase broad political support both at home and abroad. That his programme was unsustainable in the medium to long term was apparent to anyone with a basic grasp of the commodities cycle. But combined with the charisma of the former coup leader it was more than enough to hold off a fractured and demoralised opposition, whose populist clothes he had stolen. “Chavismo”, as his heterodox political doctrine immediately became known, was whatever the former army officer said it was when he woke up in the morning. After years of denying that he was a socialist, in 2006, he campaigned for re-election on a radical left platform. Chavista militants who had once insisted they only wished to improve on capitalism switched to extolling the virtues of state control of the means of production. Expropriations ran the gamut from electricity to glassware. The state would produce everything from ice cream to babies’ nappies. Hugo Chávez died prematurely, of cancer, in 2013. In his last, dramatic broadcast, he anointed foreign minister Nicolás Maduro as his successor. In doing so he was, in a sense, engaging auto-pilot. Maduro, Cuban-trained and a former leader of the far-left Socialist League, would remain loyal to the utopian Marxism favoured by his charismatic political mentor. As a civilian, however, he would never enjoy the full confidence of the army. And his decisions, unlike those of Chávez, would need to be ratified by a collective leadership – the so-called Political-Military Command of the Revolution. At the heart of the political system devised and implemented by Chávez lies a fundamental contradiction which now threatens to destroy it. 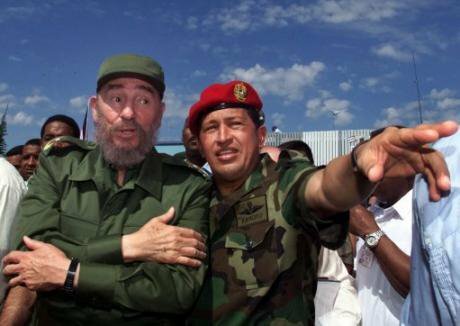 As a populist autocrat who explicitly repudiated the notion of alternation in power, and who initially sought it via a coup d’état, Chávez had been seduced by the realisation that he could win elections and thereby cement his legitimacy. But elections were never intended to lead to a change of government. In an act of hubris that now haunts his successor, Nicolás Maduro, he sanctioned the installation of an electronic voting system that makes cheating on the vote-count all but impossible. Although the playing field is grotesquely tilted in favour of the government’s campaign, votes cast (so far at least) are votes counted. It took the opposition years of hard knocks, and a lengthy period in the political wilderness, to come to the collective realisation that this was the Achilles’ heel of chavismo. Having done so, they united to exploit it, pursuing an electoral strategy that came to fruition with a stunning victory by the Democratic Unity (MUD) alliance in last December’s legislative elections. The MUD won 56% of the vote and took two thirds of the seats, aided by two events completely beyond their control – Chávez’ death from cancer in 2013 and the collapse of the price of oil shortly afterwards, which plunged an already badly ailing economy into deep recession. Now, their aim is to unseat Maduro by using another element of Chávez’ legacy – the mid-term recall referendum. But, with up to 80% of respondents in recent polls saying they want Maduro to go before the end of the year, the government now views elections – especially presidential elections – rather as a vampire regards garlic. If it can use its control of the electoral council (CNE) to delay the referendum until at least mid-January 2017, the constitution comes to its rescue. The removal of the president during the last two years of the six-year term does not lead to an immediate presidential election. Instead, the vice president (a Maduro appointee) completes the term. Under the 1999 constitution, drafted by Chávez and his allies and ratified by referendum, the Venezuelan state comprises five independent powers. As well as executive, legislature and judiciary, there is an electoral branch (the CNE) and a “Citizens’” branch made up of the public prosecutor’s office, the state auditor (Contraloría) and the ombudsman. All but the legislature are, in practice, mere appendices of the executive, staffed almost entirely by unconditional loyalists. Military officers are obliged to recite political slogans and swear allegiance to chavismo, turning the armed forces into a uniformed branch of the ruling party. A socialist militia and a network of armed civilian thugs keep a tight rein on dissent. On 11 July, Maduro announced that henceforth all ministers and government departments would report to the defence minister, Gen Vladimir Padrino López. The country’s top general is now a kind of de facto prime minister. The majority of Venezuelans have now stopped voting for “the revolution”, which can no longer guarantee them basics such as food, medicines and personal security. But the National Assembly, dominated since January by the opposition alliance, is impotent. Its bills are ruled unconstitutional by the Supreme Court (TSJ); government ministers refuse to appear before it and its very existence has been called into question. Maduro rules by decree, under a sweeping (and arguably unconstitutional) state of emergency. “The National Assembly has lost political relevance,” Maduro told the foreign press in May. “It’s a question of time before it disappears”. The CNE has so far managed to delay by four months permission for the MUD to gather the signatures of 20% of the electorate, required to trigger the recall referendum. The government insists it is impossible to hold it this year, and the TSJ is just a couple of pen-strokes away from setting the whole process back to square one, by declaring that the opposition may be guilty of fraud. Protests are held in check by police and National Guard riot squads, which enforce “security” or “peace” zones in which opposition demonstrations are forbidden. Referendum petition supporters are sacked from posts in the public sector or forced to rescind their signatures. At glacial speed, members of the Organisation of American States (OAS) are moving to enforce the rules of representative democracy on which the inter-American system is founded. Luis Almagro, a former Uruguayan foreign minister and now secretary-general of the OAS, is attempting to shame them into action. But the governments of many member states are reluctant to create a precedent by intervening to back the legislature against the executive on an issue of principle. The risks of inaction are many. Venezuela may dissolve into violent chaos, or lapse into chronic poverty and misrule. Neighbouring countries are already bracing for an influx of migrants fleeing violence, starvation, ill-health or all three. In May, the Curacao Red Cross said it was preparing to receive Venezuelan refugees. Trinidad reports over 100 asylum-seekers so far in 2016, as well as increasing numbers of Venezuelans simply looking for food or medical attention. When the border between Colombia and Venezuela was briefly opened on 10 July, the Colombian authorities said 35,000 Venezuelans poured across, mostly to buy food and other basics. Controlling the spread of epidemics in the region will be much harder amid the ongoing collapse of the Venezuelan health service. Failing to insist on adherence to democratic norms can only encourage other aspiring autocrats. The Inter-American Democratic Charter, invoked by Almagro at the end of May, allows the OAS to bring its diplomatic weight to bear against governments that – though elected – rule dictatorially. That will mean fostering a serious negotiation process, with a clear agenda and a rigorous timescale. This should replace – or at least reinforce – the nebulous and unilateral “dialogue” initiated by former Spanish premier José Luis Rodríguez Zapatero under the auspices of Ernesto Samper, secretary-general of the Union of South American Nations (UNASUR). Without facilitators who enjoy the trust of the MUD as well as the government, and a genuine negotiation process, there is little hope of a peaceful, democratic solution. In the unlikely event that the recall referendum is allowed to proceed in a timely fashion, it might well lead to immediate violence, or to a prolonged period of political instability. In the meantime, the international community must oblige the Maduro government to acknowledge the humanitarian crisis and stop blocking donations of food and medical supplies. Venezuela is on the edge of the precipice. Concerted action may yet pull it back. But the longer it is delayed, the more Venezuelans will die from lack of medicines, malnutrition or violence. And the harder it will be for the country to recover.